If it’s just someone jerking around, you can decline access within a set timeframe, after which, they will be able to view your Vault from their account. This update now brings it somewhere in line with rival Dashlane. The other notable password manager, 1Password, doesn’t offer such a feature and, due to the way users self-host their password locker, may never be able to. 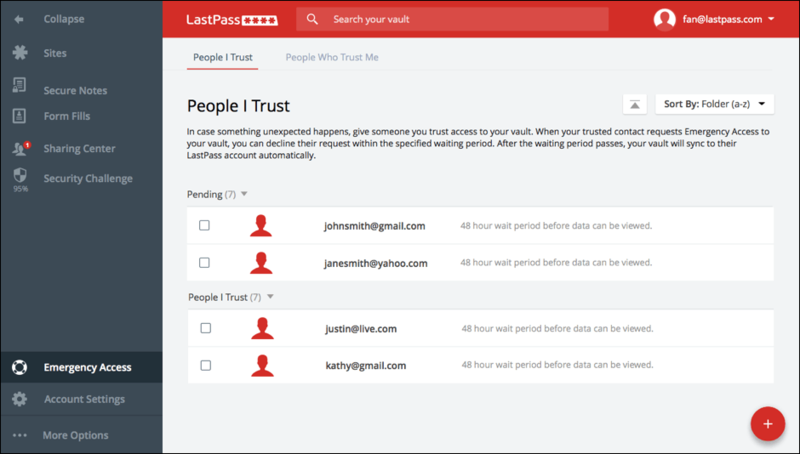 A new Sharing Centre has also been added to LastPass so you can see the settings enabled for all of the top-secret documents you’ve uploaded to the site. The company has also updated its homescreen, including a quick add button for you use when you want flag new logins to be added to your account. And you can now more easily search, edit and customise your Vault with an updated search bar, a hovering edit function for each of your accounts and an option to view in either list or grid format. The company sought to move on quickly from the password hack it experienced in June, which was followed by its October acquisition of rival LogMeIn to help it create the password manager to kill all passwords. It also streamlined its price structure, changing its free tier to work across all your devices as long as they’re from the same manufacturer.